After struggling with fragmented systems and inconsistent user experiences, Cisco unified seven different recruiting systems into one platform for talent acquisition. 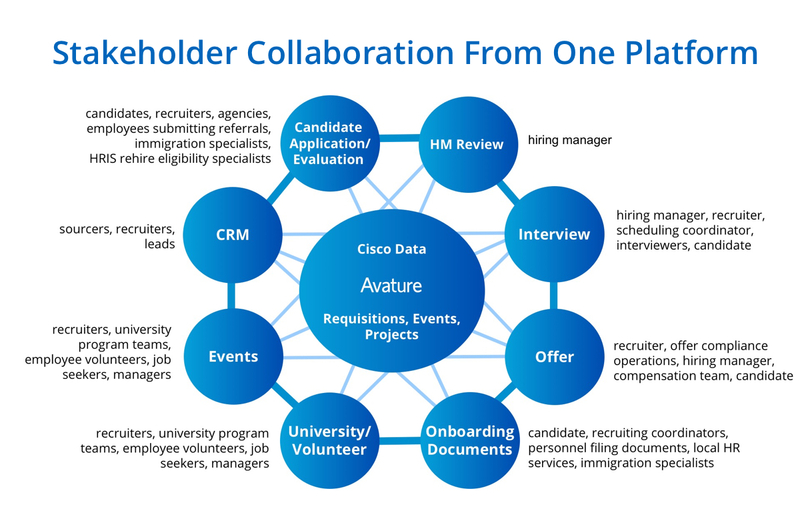 Now using a single system, Cisco manages its entire talent acquisition process on Avature, including job creation, events, application, evaluation, offer, onboarding, university program management, CRM, and related handoffs between teams. Increased productivity, user experience, and data-driven results — these are just a few of the gains from Cisco’s one-platform approach to recruiting using Avature. A global technology company, Cisco creates the Internet solutions that make networks possible. The Fortune 500 company also specializes in security, collaboration, cloud, and data centers. Cisco hires over 10,000 new employees annually from a pool of 800,000 candidates. Prior to partnering with Avature, Cisco relied on a legacy Applicant Tracking System that lacked tools for collaboration, request management, recruitment marketing, mobile optimization, or events management. In order to meet a growing need to engage candidates in new ways, Cisco overlaid additional solutions and added unintegrated tools to their technology ecosystem. Eventually, recruiting teams were working with seven distinct systems — many of which didn’t integrate at all. The disparate solutions also cost candidates’ time and energy. The application process was long and required multiple pages, and candidates needed various usernames and passwords. As candidates hopped through the different tools, Cisco lost valuable metrics such as source and referral information, making it difficult to measure the success of different campaigns. recruiters needed to use and manually update the same information into separate systems through the process. Different systems had more or less information causing confusion and data was quickly outdated. This led to miscommunication, duplication, wasted time, and a higher risk of error. Ready for change, the Cisco team opted to retire their legacy ATS and the disjointed systems in favor of one, consolidated Avature platform. Bundled together, the unified technology manages the entire process of talent acquisition, from shoulder tap to first day. This means that from a user perspective, there is one interface, consistent experience, one universal login, and one repository of candidate and employee information. Cisco recruiters and coordinators are able to focus on higher value-add activities rather than spending time on manual data-entry tasks, rework, or administrative activities. Hiring managers can perform their key tasks during the recruiting process through a dedicated site that enables them to take actions on jobs and candidates and have easy access to status and reports. Using Avature as a centralized platform enables recruiters to view all of a candidate’s history in one place, from sourcing and events to onboarding. Having this visibility at their fingertips helps recruiters make more informed decisions, improving both the recruiter and candidate experience. They can make use of the CRM capabilities for their events and sourcing requisitions too. Offer creation on Avature is elegant. It is simple for the recruiter while being completely controlled and supporting our complex options/needs. Before generating the offer, the recruiter can collaborate with stakeholders and receive needed approvals all on the Avature platform. Globally, we have all new hires accept their offer with full e-signature capabilities. This has improved the candidate’s experience and reduced the average offer acceptance rate by two days. Upon acceptance, Avature automatically generates the correct onboarding tasks and documents based on their location, entity, and type of hire. Once they complete the onboarding process, Avature notifies stakeholders and exports necessary documentation directly into our internal repository. In the end, the one-platform approach serves all key stakeholders, from executives in the C-suite to candidates on their smartphones.